After Carol finds out the truth about her past and how Yon-Rogg lied to her, she claims she can no longer wear the Kree colours (dark green) and allows Monica to choose the new colour scheme of her suit. But why does she not make any attempt to get rid of the Kree star symbol on the chest of her suit? We see this symbol in various places on Hala so it's clearly a national/global symbol of the Kree race so surely it would make more sense to change it rather than the colour of her suit? 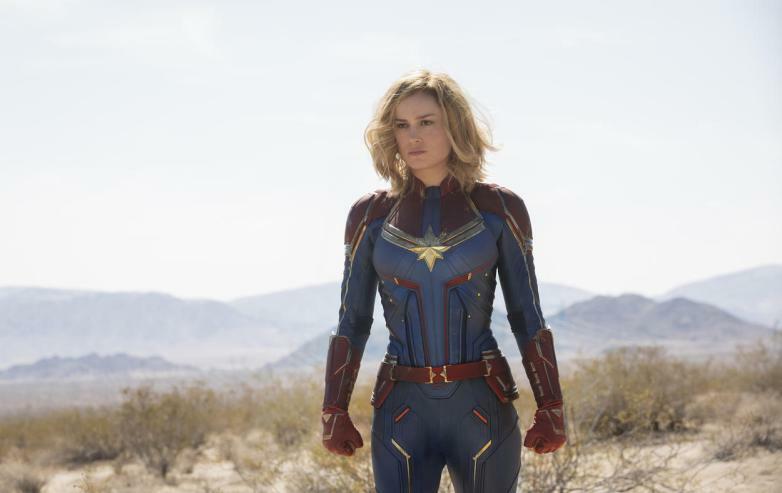 The emblem may provide some kind of function in the suit which may prevent her from removing/changing it, but most of the functionality of the suit seems to come from the bracer on her wrist. Also, Carol seems to have enough engineering know-how (she's able to upgrade Fury's pager to be able to call her across the galaxy) that she should be able to tinker with the emblem enough to at least change the exterior look of it. I myself wondered about this for a while and have come up with a few possible reasons. The suit was based on Monica's t-shirt which was red, blue and had a star on it. As such it seems likely that Carol kept the star as a reference to this as well as the other reasons. Click to enlarge and see the full image. It's also worth pointing out that as mentioned in Stark07's answer the suit itself probably didn't have the in built functionality to be able to make physical changes, it only appears to be able to change the colour of the suit. Therefore, she would probably have had to make the modifcations by hand rather than through any built in process. However, there are two things that could be evidence against this theory. The first is that her helmet comes out of the suit so maybe it can make modifications on the fly. Of course this is easily explained by this being an in built function though. The second and perhaps more important thing though is that we do see her change the appearance albeit ever so slightly of the suit as mentioned below. She adds gold bands at the side of the star which do look slightly different to the bands that were there previously. The mission wasn't exactly time critical but it did need to be done quickly. Carol didn't exactly have the time to play around with such an unimportant part of her suit, changing the colours immediately sends the signal that she's changed. Further changing the symbol wouldn't have affected that much. If I'm remembering correctly when she actually decides to change the colours she's just about to leave so there probably wasn't time to take the suit off and remove the logo. As mentioned above changing the colour of the suit sends a strong signal that she's changed alliances and so changing the symbol wasn't actually necessary. Although all the stars look similar, they're different for each member of the Kree Starforce team. So they are kind of like personal heraldry for each "warrior hero". This Reddit post illustrates the differences. So she wouldn't change her personal insignia as it's unique to her. I guess it was just lucky she has the coolest, most-iconic design. I believe that the suit modification function could modify only basic appearance, such as colours, and couldn't really alter the physical structure of the suit. We see her playing around with various colour combinations, but never does the suit change the basic structure. Think of it like having LCD panels everywhere on the suit. You can't change the shape, but you can tune the colour. 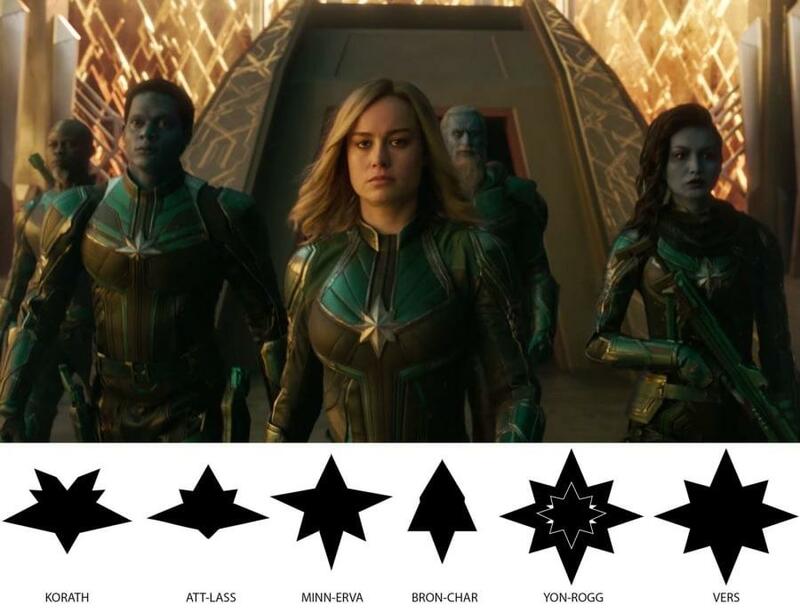 I noticed this, too, but I assumed the in-universe explanation is the star was functional, and not just decorative... that it housed some of the tech needed to make the rest of the suit or arm-piece work, and therefore was not so simple a thing to remove. Not the answer you're looking for? Browse other questions tagged marvel marvel-cinematic-universe captain-marvel-2019 captain-marvel or ask your own question. Why does Cosmo need the space suit in Guardian of the Galaxy? Why does Stark have to be in the Iron Man suit at all? Why does the Iron Man suit fail to notice someone approaching Tony while in sentry mode? Why does the Dark Dimension have time when Strange arrives? Why doesn't the Iron Man suit heat up when firing or flying at high speeds? Why does Skye / Daisy / Quake use such a limited version of her power when fighting? Why does Captain Marvel assume the planet where she lands would recognize her credentials?